Cf. Giambattista/Richardson/Richardson, Physics, 2/e, Multiple-Choice Question 29.4. The current in a long wire is increasing over time. A square metal loop (of resistance R) is located below the wire. What is the direction (clockwise/counterclockwise) of the current induced in the square loop? Explain your answers using the appropriate right-hand rules, Faraday's law and Lenz's law. Correct. Applies RHR2 to determine direction of (increasing) B field through the loop (out of the page), which means magnetic flux out of the page increases over time, then uses Faraday's law and Lenz's law to determine that the loop's induced magnetic field must point into the page, and uses RHR3 to determine the direction (clockwise) of the induced current in the loop. As (p), but argument indirectly, weakly, or only by definition supports the statement to be proven, or has minor inconsistencies or loopholes. May have direction/sign wrong in RHR2/flux/F's law/L's law/RHR3 process. Nearly correct, but argument has conceptual errors, or is incomplete. Few missing pieces, but still demonstrates RHR2/flux/F's law/L's law/RHR3 process. A Physics 205B student has a set of converging lenses with focal lengths 0.50 cm, 6.0 cm, 70.0 cm, and 150.0 cm. Describe the two lenses that should be selected as the objective and the eyepiece to make a telescope with the largest magnifying power, and what the distance between the objective and eyepiece lenses should be. Explain your answer using equations and/or diagrams. Correct. Chooses longest focal length lens for objective, and shortest focal length lens for eyepiece, and the distance between the objective and eyepiece is the sum of their focal lengths. May clearly show how the objective primary focal point and eyepiece secondary focal point coincide, in lieu of stating L = fo + fe. Education research: ALLS demographic results (Cuesta College, fall semester 2010). Education research: ALLS pre- to post-instruction opinion results (Cuesta College, fall semester 2010). Education research: ALLS pre- to post-instruction opinion results (Cuesta College, spring semester 2010). Education research: ALLS post-instruction opinion results (Cuesta College, spring semester 2010). Education research: ALLS demographic results (Cuesta College, spring semester 2010). Education research: ALLS pre- to post-instruction attitude shifts (Cuesta College, fall semester 2009). Education research: ALLS pre- to post-instruction attitude shifts (Cuesta College, Fall 2009). A statistically significant (p < 0.05) positive shift was observed for the interest in using telescopes/binoculars in astronomy (question 1); there was a statistically insignificant positive shift in Spring 2010, and notably a statistically significant (p < 0.05) negative shift in Fall 2009! Also no statistically significant (p > 0.05) shifts were observed for relating astronomy to personal experience (question 2), interest in astronomy-related news (question 5), pondering astronomy-related questions (question 6), self-efficacy in use of calculators and math in astronomy (questions 7 and 8), individual/group learning habits (questions 9 and 11), and self-efficacy in math/science (questions 13 and 14). Education research: ALLS pre- to post-instruction opinion results (Cuesta College, Spring 2010). Education research: ALLS post-instruction opinion results (Cuesta College, Spring 2010). Education research: ALLS demographic results (Cuesta College, Spring 2010). Education research: ALLS post-instruction opinion results (Cuesta College, Fall 2009). Education research: ALLS demographic results (Cuesta College, Fall 2009). Construct a circuit consisting of a single 9-V battery, and as many Xmas light bulbs (and connectors) as necessary such that there are bulbs with at least three different brightness levels. Make the appropriate measurements to determine the current and voltage drop of each different brightness bulb when on, in order to calculate the resistance and power dissipated for each unique brightness light bulb (with significant figures). Discuss how your measurements/calculations demonstrate that there are light bulbs with three different power levels. During the last week of instruction, students were given the opportunity to evaluate the laboratory components of the course in an online "Physics Laboratory Learning Survey" hosted by SurveyMonkey.com. These are the complete survey results. Analysis will be forthcoming after more data has been compiled from future semesters. Values for the mean and standard deviations are given next to the modal response category for each question. Note that the order of questions within certain sections were randomly scrambled for each student. preparation/involvement for lab? Mark all that apply. II.2 How often did a lab build upon a previous lecture experience? II.3 How often did a lab build upon a previous lab experience? III. Rate the level of your understanding/comprehension for a typical lab. III.1 Understanding of concepts before coming to lab. III.2 Understanding of concepts after pre-lab discussion, before starting work. III.3 Understanding of concepts after completing in-lab work. III.4 Understanding of concepts after completing lab report. III.5 Comprehension of overall lab procedure/instructions. III.6 Comprehension of overall lab purpose. IV. Typically a lab would help me understand the concepts. before the start of lab (including work on pre-lab assignments)? the laboratory portion of this class. "The labs were fun, but I never understood the reflection part of it." "The 205A lab was just a waste of time but this lab was actually helped me understand the material better ( To be honest I didn't expect that to help me at all)"
"I feel we did not go over the concepts enough in lecture before doing the labs." Education research: post-instruction feedback on laboratory (Cuesta College, Physics 205B, spring semester 2010). Cuesta College students taking Physics 205B (college physics, algebra-based, mandatory adjunct laboratory) at Cuesta College, San Luis Obispo, CA use flashcards to engage in peer-interaction ("think-(pair)-share") discussion questions during lecture, and complete weekly online reading assignments (hosted by SurveyMonkey.com), where they answer questions based on reading their textbook, material covered in previous lectures, opinion questions, and/or asking (anonymous) questions or making (anonymous) comments. During the last week of instruction, students were given the opportunity to evaluate the instructional components of the course, and the use of flashcards, online reading assignments, and online homework reports (Matthew L. Trawick, The Physics Teacher, vol. 48, no. 2, p. 118) in an online "Learning Resource Survey" hosted by SurveyMonkey.com. Questions from section II are adapted from the Student Assessment of Learning Gains (SALG) survey (developed by Elaine Seymour, Wisconsin Center for Education Research, University of Wisconsin-Madison), and questions from section III (III.1, III.3, III.5, and III.7) were adapted from a "Clicker Attitude Survey" (N. W. Reay, Lei Bao, and Pengfei Li, Physics Education Research Group, Ohio State University). These are the complete survey results. Analysis will be forthcoming after more data has been compiled from future semesters. Values for the mean and standard deviations are given next to the modal response category for each question. Note that the order of questions within sections II, III and V were randomly scrambled for each student. II.2 Doing unassigned flashcard questions. II.3 Using flashcards to participate in class. II.7 Instructor follow-up on difficult online homework report problems. II.10 Interacting with other students outside of class. II.11 Group problem solving sessions (on whiteboards). II.12 Group concept mapping (on whiteboards). your beliefs about the use of flashcards in this class. III.1 I like using flashcards. III.2 Flashcards helped me understand lectures better. III.3 I would recommend using flashcards in future semesters of Physics 205B. III.4 I will avoid other classes using flashcards in future semesters. III.5 Flashcards were a positive experience. III.6 Too much time in class was spent using flashcards. III.7 Too many flashcard questions were asked. III.8 Using flashcards was difficult. the use of flashcards in Physics 205B. "one answer could be, 'I would know the answer, and know how to do it, but I ran out of time.'" "It helped us apply something that we had just learned instead of having to gruel over it later for homework." "I think I little bit too much time is given to come up with answers but flashcard questions are helpfull to formulate questions to ask in class. Otherwise I had a hard time remembering what i was confused about on the homework." "Flash cards helped me study the most for quizzes and tests." "When doing flashcard questions which have multiple scenarios given by which one you circle, I would have liked to go through all scenarios for each problem that we did. I felt that when we did the questions in class, we would do the easiest scanarios and skip the harder ones." "I believe there should be more questions in each sections. they were the most helpful thing during this class." "An answer key to the flashcard questions would be helpful for the quizzes"
V.1 Online reading assignments were a positive experience. V.2 I like working on the online reading assignments. V.3 Too much time outside of class was spent working on online reading assignments. V.4 I will avoid other classes using online reading assignments in future semesters. V.5 Online reading assignments helped me understand lectures better. V.6 Too many online reading assignment questions were asked. V.7 I would recommend using online reading assignments in future semesters of this class. V.8 Completing the online reading assignments was difficult. the use of online home assignments in Physics 205B. "a list of what to skip and what to read in a chapter"
"The actually reading assignments themselves were very easy. The hard part was remembering to do them." "They weren't too hard, but also not that helpfull." "A lot of the time the reading was too confusing without having lecture first." "I found that online reading assignments were not very helpful. We would go over things in the reading assignments that werent even covered in lecture. I felt it easier to not read the book and just go off the information taught during class. Also online reading assignments were always different in regards to whether they were on the material we aready covered or what came next so I never knew what to read before doing the assigments. Also I think if you are to continue to do the reading assignments, if it looks as though the class was confused on a specific question, go over that answer right away instead of saying 'we will get to that in lecture' because I could never tell if the question was answered in lecture or not or if you continue to talk about the answers in lecture make sure to address that that was the answer to this specific reading question." "Being ahead of the class is always helpful." VII.1 Online homework reports were a positive experience. VII.2 Instructor follow-up on difficult online homework report questions was valuable. VII.3 Online homework reports motivated me to complete (or try to complete) problems on my own before coming to class. VII.4 Too many online homework report questions were asked. VII.5 I would recommend using online homework reports in future semesters of this class. "Its easy to forget to do your homework when the means to do it is on the computer ." "The idea is a good one, but there is no accountability if you don't do the assignment." "Sometimes the homework problems were helpful but we didn't really have enough class time to go over the problems. Maybe try making time for an example before the homework so that there are less questions after the online assignment???" "Some questions I had difficulties on were often not on the homework report. it would be helpful to ask if there were any problems not on the report that we may have needed help on." "I liked the whole method of the class, and how the instructor kept track of every student's steps." "Solving difficult problems and flash card questions was the best." "It was harder to motivate myself rather than if we had to turn the homework in but it was nice..."
Cuesta College students taking Astronomy 210 (introductory astronomy) at Cuesta College, San Luis Obispo, CA used flashcards to engage in peer-interaction ("think-pair-share") discussion questions during lecture. During the last week of instruction, students were given the opportunity to evaluate the use of clickers in implementing peer-instruction in an online "Think-Pair-Share Survey" hosted by SurveyMonkey.com. These are the complete survey results. Analysis will be forthcoming after more data has been compiled from future semesters. Values for the mean and standard deviations are given next to the modal response category for each question. your beliefs about think-pair-share in this class. II.1 I feel comfortable engaging with think-pair-share with other students. think-pair-share flashcard use in this class. "I think you should let the students make the questions and ask their classmates"
"it seems to work fairly well for our setting." "I think it's a pretty good way of gaining more understanding and being able to come up with an explanation, to ensure 'you' actually know why." "flash card questions are fine, but i really wish our tests/quizzes were visibly graded when handed back to us"
"I liked it because usually another students explanation of the answer is easier to understand and makes more sense to "
"I think flashcards are a good idea, it helps me better undertand the topics we cover in class"
"I think think-pair-share is beneficial because it is useful to learn from your peers"
"The think-pair-share flashcard use in class is very helpful also, it is fun to quiz yourself." "its a great technique for students an many schools should use it more often"
"I didn't find the use of think-pair-share to be very beneficial to me in this class. I rarely had someone that could explain their answer to me in a way to make me change my answer, or to help me come to a decision if I was unclear." "Its cool to have different insights on subjects. I like being able to discuise"
"I think the idea is great. I really appreciate the chance to explain it to somebody else because if I can do that it means I really know it. I think the idea would be even better if all the people who were in class said something during this time. Quite a few times, I am in a group and I have to do this, and I am the only one who talks, so I just assume that since nobody proved me wrong my answer must be right." "I think the think-pair-share flashcard system is great, although, it is lacking something very important. Once we are finished sharing and are answering for the second time (actually, even if we only answer once) as a student I need to here the answer from you, the instructor. Even if my partner during the flashcard activities is right and explains it, I am speaking from a student in your class, I would like you to clearly state the correct answer and give a thorough explination about why that is the correct choice." "I think it's a good way to learn because you get to learn it another way that may help you mote than the way the instructor did????" "I think it's a really good way to find out where the class is for certain topics and allows people to discuss and really talk things out." "They are a good way to figure out the answer as a class and a good change of pace from the lecture"
"I really enjoy doing think-pair-share because I am able to learn more than I would by just sitting listening to a lecture." "I like the think pair share method. I love being able to hear the explanations that other students have. A lot of the time they explain it in simple terms ;3"
"I really learned a lot from listening to others explain as well as the teacher." "I thought it was a great way of letting everyone think about concepts for themselves." "I think this is a good way to learn but I think if the teacher were also to participate and explain each flashcard question afterward it would help a lot"
"Flashcard questions are a good tool. Keep using them P~DAWG." "i think it is a good system. very helpful"
"I think its a pretty good system... a bit time consuming though"
"I like it because If you know you have the correct answer you can help other students also get the right answer and if you are uncertain you can get help from your fellow students when they are willing to share." "If Im following along with lecture, which I usually am when I am present, I can answer most flashcard questions." "I'm neutral for the second one b/c how i feel depends on who i am engaging with." "Very useful. When you can explain in your own words, or you get explained the point by a peer, it is easier to grasp the material." "I think its a good idea, but it would be nice if we went through all of the falsh card questions"
"I liked them except I wish that all correct answers were available to the students before the quizzes and tests." "Good system, but I wish the teacher would explain the answers more than relying on other students to do it becaus a lot of the time nobody around me knows the answer." "i wish he would go over the answer more"
"I enjoy think-pair-share because it gives me an opportunity to engage with the people around me and it either reinforces or makes me rethink my answers"
"I like using flashcards, if I know I'm right, I like convincing other people. If I am unsure, it is helpful to listen to the explanation of another student instead of just getting it wrong. It helps me remember." "I think it is helpful but i still usually chose E because i rarely know how to explain it." "Time to print out a few new ones... Some are falling apart!" "It often confuses me more. I have my own idea for the answer and they might have a different point, which gives me conflicted feelings and I'm forced to choose 'I'm lost.'" "I think the flashcards are a great learning style"
"i think it is a helpful tool because sometimes its easier to understand from someone else." "The use of think-pair-share flashcards is definitely beneficial because it enables the student to think for themselves and converse with other students to figure out the answwr instead of being given it." "i like it even though its common for both me and the people i am talking to to have guessed at the answer." "I like being able to discuss the answers with different classmates so i can get an understanding on the answer, but sometimes I feel that I don't get very good answers the questions and its hard to know why the answer is right"
"i like the thought of answering individually and if i get it wrong then seeing what everyone else got"
"I like this system because students can usually explain an outcome or event in ways that we can better understand." "Using flashcards has helped me personally, and I would recommend this instruction technique be used for future semesters." "Think-pair-share is usually helpful. Sometimes it is confusing when people are arguing their answers, but it is always eventually explained." "I really like this method. We not only get to see someone elses point of view of why you may be wrong but also we get to know our classmates a little better." "The flashcard questions help me for quizzes.. but i can never answer them in class"
Caution is advised in interpreting these results due to the extremely small number of students in this section. Students at Cuesta College (San Luis Obispo, CA) were administered a shortened version (22 out of 45 questions) of the Electric Circuit Concept Evaluation (David Sokoloff, University of Oregon) during the first and the last week of instruction. Physics 205B is the second semester of an algebra-based introductory general physics course covering optics, electromagnetism, and modern physics, with a mandatory adjunct laboratory component. Cf. Giambattista/Richardson/Richardson, Physics, 2/e, Problem 26.3. A Physics 205B is moving at a constant velocity to the right. Two lights are simultaneously trigged to flash (in the rest frame of the lights) when student is midway between them. According to the Physics 205B student, the speed of the flash from the right light is __________ the flash from the left light. From Einstein's second postulate of special relativity, the speed of light is invariant and independent of the relative motion of the observer and source. Cf. Giambattista/Richardson/Richardson, Physics, 2/e, Multiple-Choice Question 26.5, Problem 26.5. A Physics 205B student has a resting pulse of 1 second per beat. She then takes a ride aboard a spacecraft traveling at a constant velocity of 0.100c away from Earth. While the spacecraft is moving, the resting pulse of the Physics 205B student is __________ 1 second per beat, according to Earth observers. delta(t) = 1.005*(1 second/pulse) = 1.005 seconds/pulse. Cf. Giambattista/Richardson/Richardson, Physics, 2/e, Problem 26.7. The CERN Large Hadron Collider in Switzerland accelerates protons up to a speed corresponding to a Lorentz factor gamma of 3.000e3￼, as measured from a stationary reference frame (http://faculty.tamu-commerce.edu/cbertulani/cab/papers/7420.pdf). What is the speed of each proton? v = c*sqrt(1 - 1/(3.000e3)^2) = c*sqrt(1 - 0.0000001111) = c*sqrt(0.9999998889) = 0.9999999444*c.
Response (A) is 1-(1/gamma); response (B) is sqrt(1-(1/gamma)); response (C) is 1-(1/gamma^2). Consider two samples with differing amounts of radioactive elements, embedded gaseous daughter elements, and inert material (which is not involved in the decay process). Which sample is older, as determined by radioactive dating? The solidification age of a sample (how long ago has it been since it was last molten) is determined by the ratio of decay products to its unstable isotopes. A larger ratio of decay products to unstable isotopes corresponds to a sample with a very old solidification age. Astronomy quiz question: radioactive decay age. Physics quiz question: radioactive decay age. (B) no venusquakes detected by landers. (C) no subduction zones nor midocean rises. Since the main features of plate tectonics are subduction zones and midocean rises, the lack of subduction zones and midocean rises on Venus is evidence of its lack of plate tectonics. __________ caused the long curving ridges on the surface of Mercury. (A) Lava flooding in lowland basins. (B) Compression and shrinking of the crust. (C) Convection currents underneath the crust. Mercury's rupes, or lobate scarps, were formed as its relatively thin crust wrinkled and shrank as its massive underlying core cooled and contracted. Jupiter's __________ is evidence that it contains liquid metallic hydrogen. (B) cloud bands parallel to the equator. The circulation of Jupiter's liquid metallic hydrogen is the dynamo creating its strong magnetic field. Of the following choices, which solar system object(s) meets only qualifications I and II? (B) Ceres, a dwarf planet. Ceres directly orbits the sun (it is not a satellite of a planet), is round in shape, but does not dominate its orbit in the asteroid belt around the sun. Of the following choices, which solar system object(s) meets only qualification II? Earth's moon is round in shape, but does not directly orbit the sun (it orbits Earth, which itself orbits the sun); and also Earth's moon does not dominate its orbit around the sun. Cf. Giambattista/Richardson/Richardson, Physics, 2/e, Problem 29.21. So the percent decrease in 10 years will be 1 – 0.984 = 0.016, or 1.6%. (B) lack of shield volcanoes. (C) lack of tidal heating. The surfaces of all terrestrial planets (and Earth's moon) accumulated impact craters during the heavy bombardment phase of planetary formation. Geological activity is responsible for removing these impact craters (filling in with lava, folding down into the mantle from tectonic plate motion), such that a lack of impact craters corresponds to a greater amount of geological activity, and a newer (more recently solidified) surface. Joule thief (wki.pe/Joule_thief), built with Radio Shack parts and a mint tin, circuit diagram based on Make magazine's how-to tutorial (makezine.com/2007/11/02/make-a-joule-thief-weeken-1/). (E) absorption and emission spectra. (A) pockets containing pristine solar nebula gas. (B) high energy particles bombarding its icy surface. (C) subsurface organisms capable of photosynthesis. (D) chemical processes that may eventually evolve into life. (A) two moons that may soon collide. 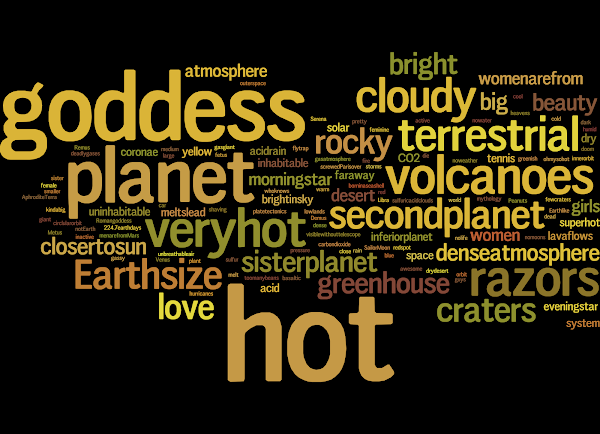 Wordle.net tag cloud for "Venus" generated by responses from Astronomy 210 students at Cuesta College, San Luis Obispo, CA (http://www.wordle.net/show/wrdl/2817770/Untitled). 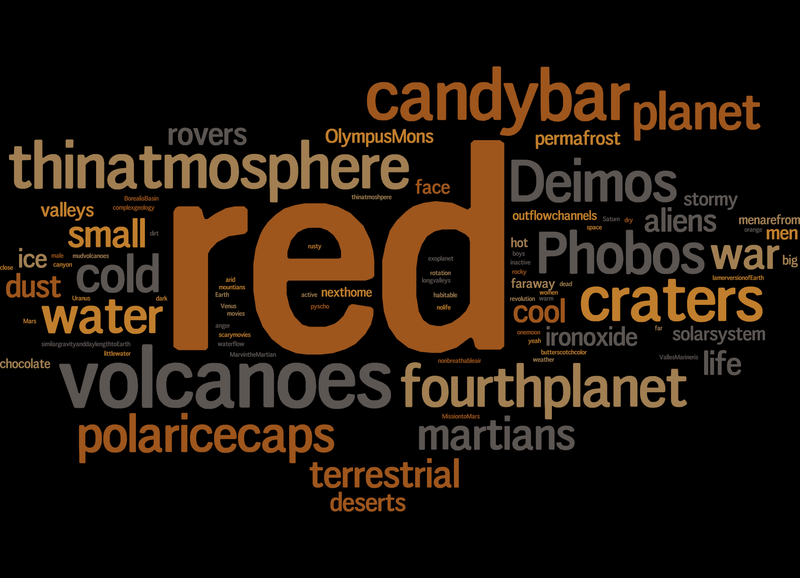 Wordle.net tag cloud for "Mars" generated by responses from Astronomy 210 students at Cuesta College, San Luis Obispo, CA (http://www.wordle.net/show/wrdl/2817749/Untitled). 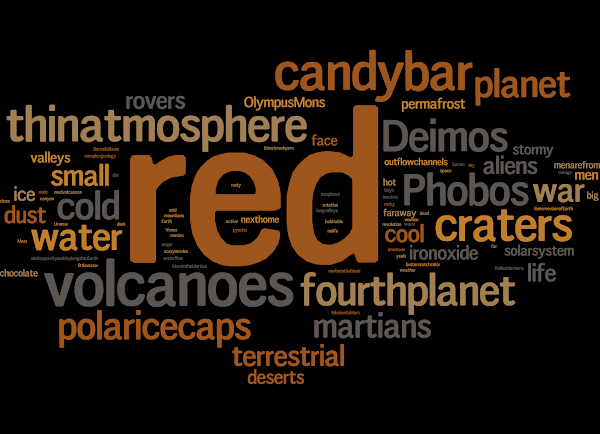 dust, ice, terrestrial, mudvolcanoes, life? polaricecaps, thinatmosphere, red, stormy, nexthome? red aliens close candybar water? Online reading assignment question: Venus, Mars tags (Astrolrner@CAE readers, August 2010). Online reading assignment question: Venus, Mars tags (Cuesta College students, Fall semester 2009).